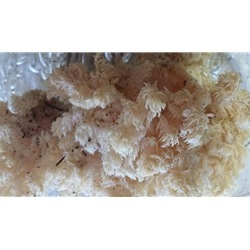 Hericium erinaceus also called Lion's Mane Mushroom, Satyr's Beard, Bearded Tooth Mushroom, Bearded Hedgehog Mushroom, pom pom mushroom,Bearded Tooth Fungus, or pom pom mushroom. These are wild, not cultivated. They will have some debris from the woods.They are considered a gourmet mushroom by many people. They have a seafood-like flavor, somewhat like the taste of shrimp or lobster, but it is not an overwhelming flavor. So if you are allergic to shell fish this is a great substitute. They are said to have medicinal values as well, but we cannot say anything about that due to legalities. We recommend you research the medicinal benefits though. We are working on a process to dry them, so they will be available year round. If you want them dried, let us know, we will have a very limited amount available. Dried mushrooms are much better for you than capsules, they also taste better. The capsules you purchase are not as strong as you would think. Most capsules are filled with other ingredients. Fresh Edible Mushroom. Product is wild from Oregon USA. Fresh Lions Mane are available from late September until Early November.